We’re officially on the gluten-free express train. Our kitchen was mostly gluten-free before Dave’s diagnosis but now there’s actual gluten protocol to follow (i.e., no gluten at all en la casa). This isn’t a huge deal, as I can always scarf chewy chunks of Panera baguette in my car and continue to have glutinous adventures at work, where we eat as if it’s the last day on Earth everyday (they get me). The new rules have inspired creativity [when I’ve had time to cook], as evidenced in last night’s ingenious mashed cauliflower. What a great idea! Total mashed potato fake-out. Yes, potatoes are gluten-free but cauliflower is a lower GI food, has more vitamins, blah blah blah. The mashed cauliflower can be as light or as creamy and indulgent as you’d like and, as for the roasted chicken, it’s delicious and easy and everyone loves roasted chicken. That’s all the intro roasted chicken ever needs. ‘Twas a hearty, warming, comforting dinner perfect for fall. Both of these recipes are pretty quick. The chicken pan roasts, then finishes in the oven; the cauliflower boils and is puréed. Facilisimo. Let’s start with the chicken and then make the cauliflower as the chicken roasts. Preheat your over to 350. 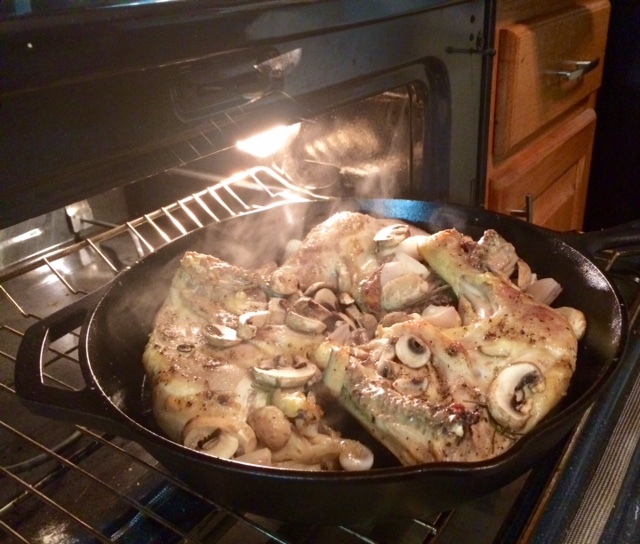 In a cast iron or other oven-safe pan, heat the olive oil over medium. If you’re making cauliflower now, bring a large pot of water to a boil. Sprinkle both sides of the chicken leg quarters liberally with salt and pepper and add, skin-side down, to the hot oil. Cook for 5 minutes, letting the skin brown. Flip over and cook the backsides for 5 minutes as well. You may want to use a splatter guard, as the olive oil will be deliciously crackly and splatter-prone. 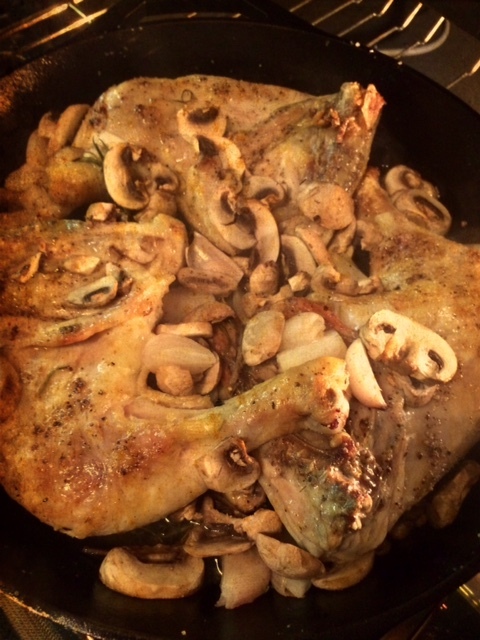 When both sides have browned, top the chicken with the sliced mushrooms, shallots, and rosemary, tucking the veggies in between the chicken pieces. Slide the pan into the hot oven and let roast for 20 minutes. Cauliflower time! If you haven’t already, bring a large pot of water to a boil. Add the cauliflower florets and boil for 6-8 minutes, until softened. Drain well in a colander, but don’t let the cauliflower cool off too much- you’ll use its heat to melt and disperse the cheeses and butter (mmm, melting cheeses and butter). When the cauliflower has drained, add it to a food processor or put it back into the pot you boiled it in if you’re using an immersion blender. Add your chosen cheeses, garlic, bullion, milk, and pepper. Blend. Taste for seasonings and consistency and adjust as needed (salt, pepper, more milk, more cheese, etc.). Eat a few spoonsful and top with chives. Back to the chicken! The amazing part is, your chicken is done. It will look fabulous. Remove the chicken and veggies to a platter, discarding the rosemary sprigs, and let rest for 5 minutes before serving to lock in the juices (I love saying that). Lock ’em in. Now would be the time to make a simple pan sauce or sprinkle with lemon juice, if you’d like. The dish is certainly tasty enough to not need a sauce, but it wouldn’t hurt. Pour a glass of wine (pairing recommendations here), scoop up some cauliflower, cut a piece of chicken, and enjoy. 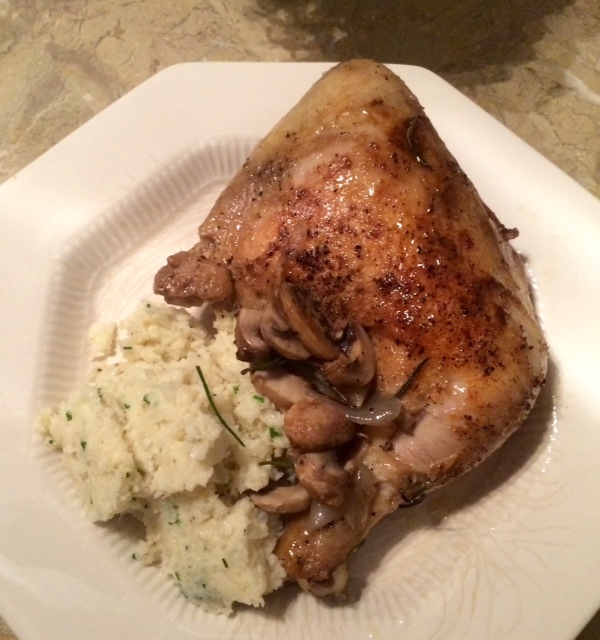 This entry was posted in Chicken, Classics, Dinner, Easy, Fancy, Fast, Gluten free, Side Dish and tagged cauliflower mashed potatoes, chicken roasted with mushrooms, classic roasted chicken, garlic mashed cauliflower, quick roasted chicken, roasted garlic mashed cauliflower. Bookmark the permalink.